Service Recognition Awards from Select-Your-Gift gives employees a choice of gifts from the provided catalog or online. 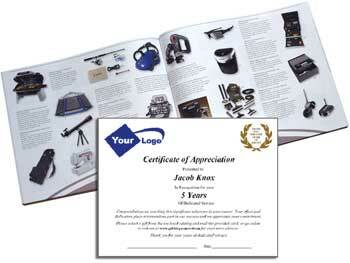 Express your appreciatation for your employee's loyalty and long service with a service recognition award packet that's personalized with your company's logo and message, plus the employee's name and anniversary. Service Recognition Awards for Employee Anniversaries include many options for customization and are available in many price levels to correspond to each of your service milestones. Employee satisfaction with their award is guaranteed. For one low price for each employee service recognition award package, everything is included: an awards catalog, all of the presentation materials, redemption using the included pre-paid postcard or online, the chosen gift, and shipping of the gift to the employee within the lower 48 US. We offer a variety of Employee Incentive, Recognition, and Gift solutions - no matter what your needs are. The actual presentation of Service Milestone Recognition Awards gives each employee a moment in the spotlight. If possible, present the award at a meeting in front of their peers. Use the opportunity to praise the employee and talk about recent contributions as well as recognize their length of service. 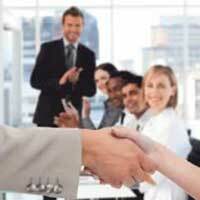 You'll be showing all your employees, with style, that your company appreciates dedication and loyalty. Select-Your-Gift is one of the largest employee service award companies in the US. A single point of contact will work closely with you, personally reviewing your unique needs and the available options that can help you develop and maintain an efficient, effective and cost-saving recognition program. View our awards for employee recognition today.